At a recent city council meeting, one of our city council members told a funny story I wanted to share with you. A while back he had neighbors who had quite a few dogs who where noisy and annoyed the neighbors with their barking. One of the dogs was named “Fire.” On a regular basis these neighbors would open their back door and scream at or for the dog, yelling “Fire” loud enough for most of the neighborhood to hear. Needless to say, when the neighborhood heard someone yelling “Fire” they stopped what they were doing and looked for smoke. But it was never smoke, it was just a badly chosen dog name. So let this be a lesson. Never name your dog “Fire!” Well, maybe the dog below could be named Fire, but no one else! One of the blogs I happen to follow is called Elephants and Rutabagas (which can be found at http://elephantsandrutabagas.wordpress.com). Beth, who writes this blog, is at a different point in life than I am and she was posting yesterday about cleaning a mucky high chair. Oh, it reminded me of the good old days when my kids were young and a mucky high chair was a permanent part of my dining room decor. It also reminded me of one of our funny family stories…. 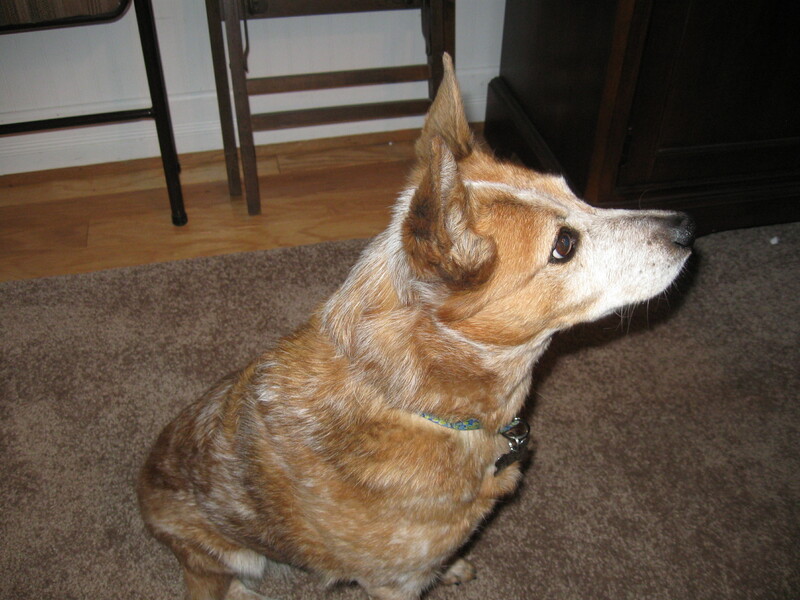 When Eldest Daughter was a tiny tot sitting in her high chair we also had a dog named Skip. Before Youngest Daughter was done with her time in the high chair Skip went to doggie heaven and we didn’t have a dog for several years. I started observing the incredible amount of food that ended up under the high chair when Youngest ate and I started getting very concerned. We never had that mess under the high chair when Eldest ate! I began to think that Youngest had some sort of fine motor skill problem, worrying as only mothers can do. I finally shared my fears with Hubby. He gently reminded me that when Eldest was that age we had a “bark-uum-cleaner” to make quick work of the mess and now we no longer had a dog to clean up under the high chair when Youngest ate. Boy, was I relieved! We have laughed about it ever since.